As the name ‘Rettai Tirupathi’ suggests, there are two temples of Lord Maha Vishnu here. Based on their locations, one is calledSouthern Temple and the other Northern Temple. In this sthalam, a munivar (rishi) named “Athreya Suprabha rishi”, started and maintained a yaaga saali (place where yaagam is done). When he was cleaning the yaaga salai, he found out a bright Tarasu (equilibrium measuring instrument) and Bow. On touching those two, it Changed into a beautiful men and a women. They both explained him that they were changed into the tarasu and the bow because of the sabham, given by Kuberan it will end only if they are touched by Suprabha rishi. And after explaining this, they both got sabha vimocchan and got paramapadha mukthi. Since, the tarasu (or otherwise named as “Thulaam”) and bow (otherwise called as “Vil”) both of tem got the vimocchan and went to paramapadham, this sthalam is named as “Thulam Vil Mangalam” and as the years passed the name changed to “Tholai villi Mangalam”. The sthala Emperumaan explains and thinks that all the humans and all other living and non living things should lead their lives in an happy way, the perumal gives his seva both in Nindra and Veetrirundha thirukkolam. Vil (Bow) is the other resemblance of Yaegapathini (good character) Character of Human. Sri Rama, who is considered to be the kind of person who loved only his wife Sita piratti, was popularly named as “Yaegapatthini Vridhan”. Having this kind of character only, he could able to life the Shiva dhanush (Vil (or) bow) and able to kill Kakkasuran, vaali and Ravanan. Tarasu (Measuring Instrument), which has two hands equally measures both the items kept on it. Out good and bad characters and activities are calculated and according to that, we are given the destiny. This sthala perumal gave his prathyaksham for Indiran, Vaayu bhagavan and Varuna bhagavan. To live, we need to inhale the air and the air is Vaayu bhagavan and other necessary thing is water and it is varunan and the green land is Indiran. By giving the prathyaksham to these three, Emperumaan equalises them and explains to the the world how important and essential they are. Kumudham means Dharbai Pul (Dharbai is one kind of Grass). Since, in this sthalam, the Yaagam was done, this sthala Vimaanam is called “Kumudha Vimaanam”. This entire world becomes so fresh and gives the Vegetation only because of the Rain that is coming down to the earth. Because of this, the Sthala pushkkarani is Varuna theertham. For the Bow (Vil) getting into action, two things are necessary. One is the arrow and another one is ther person who perform the action on the Bow. And the person who is performing this action is Sri Srinivasa perumal, who is the whole structure of Good habits and thinking and giving his seva in Nindra Thirukkolam and along the sides are two pirattiyaars are found. A persons expression of Love, his kind nature and the bhakti is expressed through his eyes. So, the bhaktas who live in a good way and lead their lives in the Dharma way to achieve Sriman Narayanan’s Thiruvadi, Emperumaan, gives his seva as “Senthamarai Kannan” and as Aravindha Lochanar along with Karuthandangi Naachiyaar. Dharma Tarasu has two plates, which stands in equal to one another, likewise the Emperumaan and Thaayar are found to be equal and giving the Veetrirundha seva. Since, both of this sthalam are found along the Tamirabarani river, how rivers flow in different direction, but when they mix together they are treated as the same, like wise even though there are two sthalams, these two are considered to be one divyadesam. All these Nava tirupathis have a common and a distinct news, that has to be explained. In thirukkurugoor Indiran, who did not give the proper respect for his parents, in Thirukkoloor where Guberan has given the Sabham, in Thirupperai, varunan treated his Guru, and in Thiru Vaikundam, a thief giving his share of the theft things to Emperumaan, in Thiru Varaguna Mangai, where Saavithri fought for her husband’s life, in Thirupulingudi, Yagnasharma, who got the sabha of Vashista Muni’s sons and in Thiru tholai villi mangalam, a men who was burried into the land as “the Bow” and a women as “Tarasu” by Guberan, got their Sabha Vimocchan. All in these nine tirupathis, Sriman Narayanan, gave them the Sabha vimocchan and to attain the paramapadha world. Joining two Azhwar tirupathi sthalams, and it is considered to be a single divyadesam, this is called as “Twin Tirupathi”. Both these two sthalams are found inside a small village where there is only small amount of human live. First temple is found along the banks of River Tamirabarani. 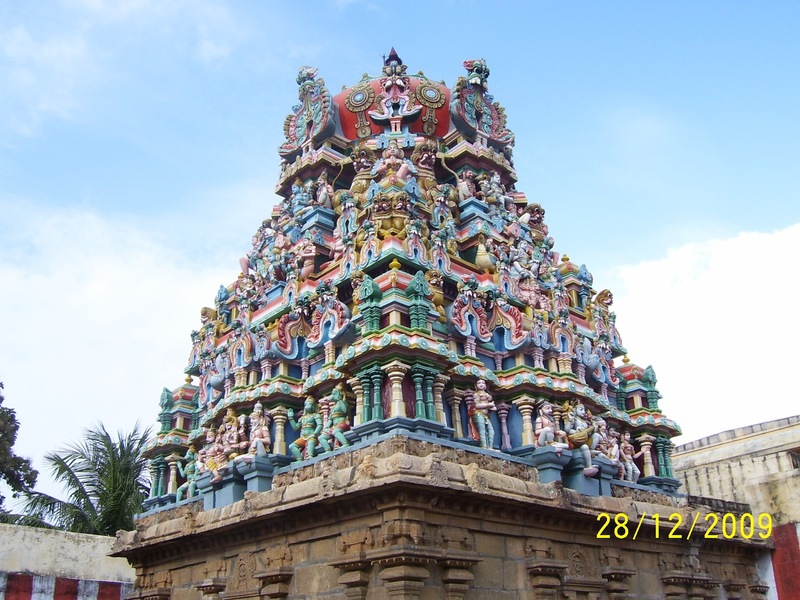 The Moolavar of first sthalam is named “Sri Srinivasan”. Also named as “Devapiran”. He is giving his seva in Nindra thirukkolam facing his thirumugam (face) facing in East direction. Two pirattiyaars are found on either side of him. This place is the seat of ‘Rahu’. Second sthalam is found along the Tamirabarani river. This sthala Moolavar is Sri Aravindha Lochanar. Also named as “Senthamarai Kannan”. He is giving his seva in Veetrirundha thirukkolam facing east direction. 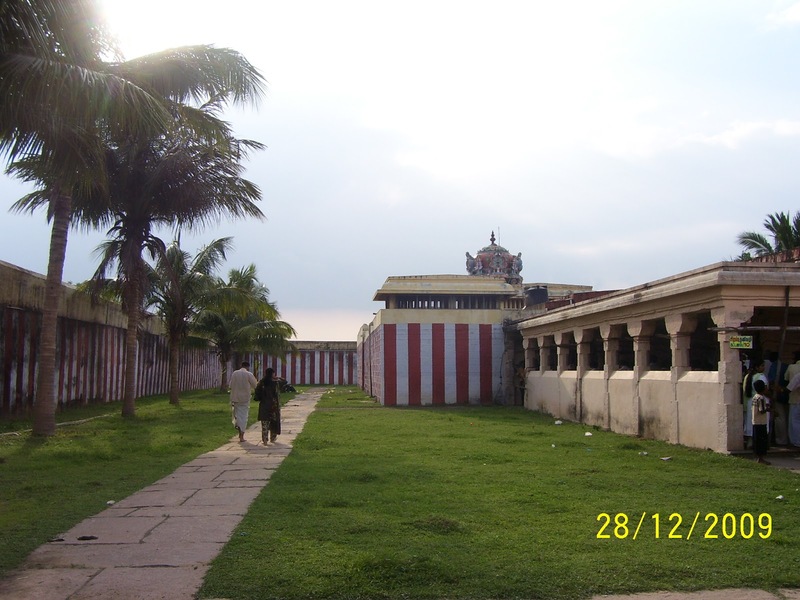 Thaayar – The Thaayar of this temple is Sri Karunthadanganni Naachiyaar. 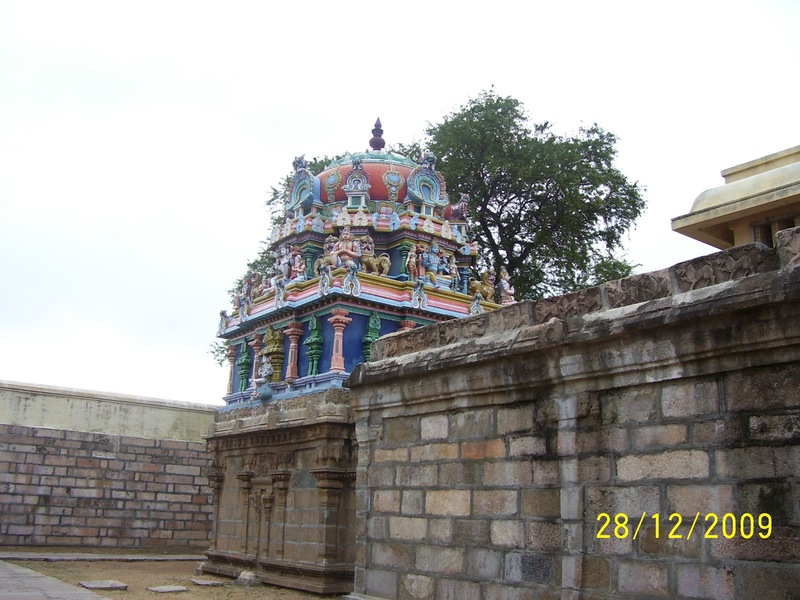 This sthala perumal is prathyaksham for Indiran, Vaayu bhagavan (Air), Varuna bhagavan (Rain). This place is the seat of Kethu. The temples are open in the mornings from 8.30 am to 1 pm and in the evenings from 2 pm to 6 pm.